Name: GREG MORAE KIM, PH.D.
Kim-Ju, G. M., Dimberg, S. K, & Sandoval, R. (forthcoming). Developing Cultural Competence and Civic Responsibility through Service-Learning. In D. Maramba & T. Fong (Eds. ), Models of Practice: Asian American, Native American and Pacific Islander Institutions (AANAPISIs) in Action. Haro, J., Kim-Ju, G. M., & Goodman, Z. T. (forthcoming). Promising Outcomes in a Higher Education Intervention Program: Academic and Social Shifts with Students in the Full Circle Project. In D. Maramba & T. Fong (Eds. ), Models of Practice: Asian American, Native American and Pacific Islander Institutions (AANAPISIs) in Action. Kim-Ju, G. M., Goodman, Z. T., & Her, S. (2018). Community violence exposure and internalizing and externalizing behaviors among Hmong Americans. Asian American Journal of Psychology, 9(2), 87–97. dx.doi.org/10.1037/aap0000089. Kim-Ju, G. M., & Akutsu, P. D. (2015). Asian American Identity Development. In E. P. Salett, & D. R. Koslow (Eds. ), Race, Ethnicity, and Self: Identity in Multicultural Perspective. Washington, DC: National Multicultural Institute. Rivera, D. S., Hao, S., Goodman, Z., Suha, C., & Kim-Ju, G. M. (2014, August). Leadership Attitudes and Civic Responsibility among Asian American College Students. Poster presented at the 2014 Asian American Psychological Association (AAPA) National Convention in Washington, D.C.
Dimberg, S. K., Rivera, D. S., Haro, J., Sandoval, R., & Kim-Ju, G. M. (2014, August). Ethnic Identity and Self Efficacy Predicting Bullying and Victimization in Ethnic Minority Youth. Poster presented at the 122nd Annual Convention of the American Psychological Association (APA) in Washington, D.C.
Rivera, D. S., Hao, S., Haro, J., Goodman, Z., & Kim-Ju, G. M. (2014, August). Geography, Ethnic Identity, and Ethnocultural Empathy: Residential Racial Segregation and Residential Mobility. Poster presented at the 122nd Annual Convention of the American Psychological Association (APA) in Washington, D.C.
Kim-Ju, G. M. (2014, April). IRB Approval Issues and Challenges in the International Context: The Case of Korea. Panel on International Review Boards: Navigating Ethics and Logistics in International Research presented with JianJian Qin, Chunling Liu, Nicola De Paul Chism, Deanna Haney, Suni Peterson, Mercedes McCormick, and Lynette Bikos (Chair) at the 94th Annual Convention of the Western Psychological Association (WPA) in Portland, OR. Kim-Ju, G. M. (2014, April). Ethnicity and Interpersonal Violence: Identifying Risk and Protective Factors. Served as Chair with Sierra K. Dimberg, Sherry Hao, Tyler Virden, Ho Man Cheung, E-Ting Lee, Vanessa Mendez, and Phillip Akutsu (Discussant) at the 94th Annual Convention of the Western Psychological Association (WPA) in Portland, OR. Khan, N., Haro, J., Cardenas, A., & Kim-Ju, G. M. (2014, April). Ethnic Identity Using Daily Experience Sampling. Poster presented at the 94th Annual Convention of the Western Psychological Association (WPA) in Portland, OR. Rivera, D. S., Hao, S., Haro, J., Wu, D., & Kim-Ju, G. M. (2014, April). Predicting Empathy through Service Learning and Leadership. Poster presented at the 94th Annual Convention of the Western Psychological Association (WPA) in Portland, OR. Anderson, S., Karsnia, K., Shaver, J., & Cardenas, N., & Kim-Ju, G. M. (2014, April). The Golden Years: Exploring Experiences of Health and Aging. Poster presented at the 94th Annual Convention of the Western Psychological Association (WPA) in Portland, OR. 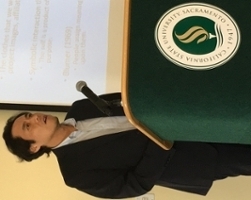 cultural psychology; collective identity (i.e., racial, ethnic, and national identities); stable and situational factors in perceptions of ethnicity and race; social and psychological correlates of academic engagement and violence; character education and moral development; cultural stereotypes and their impact on those who are targeted.